Many of the struggles in conversations about race never reach us. They consume us as a nation only when the stories end in tragedies like the one in Ferguson. Missouri isn’t the only place where those who end up debating the issue are the angry people at the two extremes. Because we struggle with complexities that defy easy answers, many of us refuse to engage in the conversation. We’re too polite. We want to avoid conflict. We’re afraid of hurting someone’s feelings. We cede the conversation to the irrational. This article is proof that many actions and movements are taking place in America that most of us know little about. 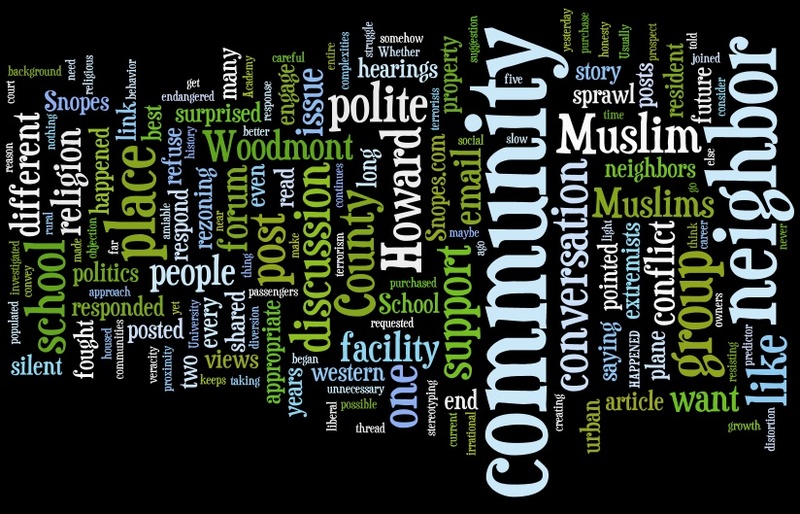 If nothing else, maybe our attendance at the future hearings would add needed support to the residents of Howard County who are attempting to stop or slow unnecessary growth within our community (concerning the Woodmont School re-zoning attempt). The Woodmont School was once a Catholic school in the rural part of western Howard County. When the school closed, a group of Muslims housed near the University of Maryland, excited about the prospect of a facility that could serve a growing Muslim community, purchased the property. But when they requested rezoning to enlarge the facility, the surrounding community sprang into action. Residents in western Howard County have a long history of resisting urban sprawl. They fought the rezoning in court, saying that they had no objection to a school of the same size as the Woodmont Academy. In May 2014 the zoning was approved, but an appeal is pending, and both groups are soliciting donations to defend their positions. The group that opposes the development is very careful to convey that they do not object to the facility, as long as it keeps its current zoning. That is not the case with some of the people who support them. Whether it happened five years ago or yesterday, IT HAPPENED! We better damn well protect our surroundings the best way we can. I was stunned. By the time I read the strand of emails, the neighbor who challenged the veracity of the original story had responded yet again that the poster had missed the point—that the Snopes staff had concluded the article by saying that when the incident on the plane was investigated, it was deemed a customer issue and not a security issue. In the two years that I’ve read posts in our discussion forum inviting those who want to support the activists to do so, I skim the posts and delete them. I am polite. I abhor conflict. I want to get along with my neighbors. But I could not, in good conscience, remain silent in the face of the suggestion that we should support those who oppose urban sprawl for the more insidious reason that we are somehow endangered by our proximity to the Muslim community. I felt compelled to respond that I was uncomfortable with the post. I pointed out that every religion has extremists, even Christianity, and that they are not representative of the vast majority of people in any faith community. I shared examples of devout Muslims I’ve known who do not fit the profile that my neighbor suggests. I said that I had learned early in my teaching career that religious background was not an accurate predictor of human behavior. I wasn’t surprised that the initial response to my post was silence. And I shouldn’t have been surprised when a different neighbor joined the conversation to say that the community forum was not an appropriate place to “post personal views on religion and politics.” She is polite. She doesn’t like conflict. She believes the best thing to do is to refuse to participate in the conversation. I understand that, though I did not consider my post a statement of my views on religion and politics—those are too complex to even try to approach in a discussion thread. I considered my response a challenge to someone who was stereotyping an entire culture. My neighbor who posted the Snopes link and I could have been silent. But what is the alternative? To allow such irrationality to go unchallenged? In every place where extremists like ISIS have gained a foothold to commit terrorism and genocide and other atrocities, it began in small communities like mine—when amiable people refused to engage until it was far too late. For now I’ve said all I will say in my community’s forum—until the next time I feel it is my moral obligation to speak up. But my blog is an appropriate forum, and I invite you to respond. Previous PostLike Anonymous Comments?Next PostWhat about Ray Rice, the Child? Your blog today highlights the experience of so many Muslims. It saddens me to see how ignorance fuels hatred. I hope and pray for a world where people are more accepting of each other…where people speak up when they see injustices happening.